The riders from both Camps participated in the First Session Horse Show on Sunday, July 14th. Guided by the expert instruction of program director Carroll Bedford and the Riding staff, these campers demonstrated their remarkable abilities! S4G hosted a co-ed game of Capture the Flag which counted towards the Orange and Blue Competition in both Camps. After four 10 minute quarters, Blue emerged victorious by amassing over 7,000 points! 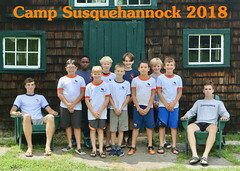 Campers of various age levels visited Chocolates by Leopold in Montrose, PA, Salt Springs State Park AND took a Canoe Trip down the Delaware River. American Independence Day observed at Camp, including Fourth of July Field Days. A return to fair and warmer weather this week allowed for a plethora of on-field activities and fun at the Waterfront! On Saturday, June 29th members of S4B and S4G gathered for the first all-Camp activity of the summer: the Super Mongo Goofy Relays. The event coordinators created teams by age and cabin assignment that visited different stations of team-building challenges around the Boys Camp. Events included Table Setting, Frisbee Relay, Scooter Obstacle Course and many others. The Super Mongo Goofy Relay results counted towards each Camp’s respective Orange and Blue Competition, which made the Relays even more exciting! It is a tradition to gather as one Camp on a Sunday each Session for a joint Chapel Service. Co-Site Director Cannie Shafer welcomed campers, staff and visitors to Cubberely Grove named for a long-time Camp Doctor. Dr. Cubberley was also a devoted nature enthusiast who relished living in a cottage on the banks of Tripp Lake. As a fitting memorial to his many years of service, the Cubberley and Susqueuannock families created Cubberley Grove at the Waterfront. While gathered in this tranquil setting, Cannie used a pepple, rock and a boulder to highlight the difference in perspective of challenges we face every day. She encouraged all to take a moment to consider the relative size of every issue in our lives. If the problem is the size of a pebble, perhaps it would be best to set it aside. When encountering rocks or boulders, it is best to devote more effort and concentration to address the problem. The First Week of First Session maintained the amazing momentum set during Opening Day. Children in both Camps were placed onto preliminary teams that played scrimmages, known as World Games, that served as an evaluation process to pick fair and balanced Orange and Blue teams. 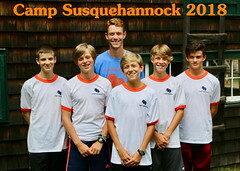 Competitive Orange and Blue teams at every level is integral to the Susquehannock experience, as we strive to foster a setting where every camper feels comfortable contributing to the team, regardless of their own skill level. 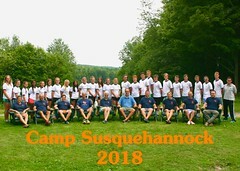 It is not uncommon for trades to be made by the coaching staff during the World Games, as we see the campers participate in the full scope of activities offered at Susquehannock. The campers are hardly aware that the evaluations are even taking place – they’re too busy having the time of their lives while playing with old and new friends! As we continue to get to know one another and build our community, both Camps hold team cheer competitions emphasizing that sportsmanship and spirit are our guiding principles, above all else. These competitions often get silly, as seen in the above photos. The staff members at both Camps are very pleased with the results of the World Games and are looking forward to a special Orange and Blue competition during First Session. Check back soon for more photos! After a seemingly endless off-season and many weeks of on-site preparation, the first day of Camp finally came! 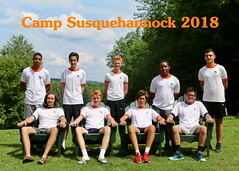 Staff members welcomed both Grizzled and new campers to Camp Susquehannock for the 108th time in history. The excitement of the day was punctuated by wonderful weather that made the moving-in process that much more delightful. 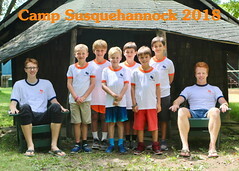 After many joyous reunions and introductions, both Camps offered pick-up activities for those campers who had prepared their beds for the Session. Co-Site Directors Win and Cannie Shafer officially kicked off the summer by welcoming one and all during an evening meeting at the Main Lodge in the Boys Camp. The S4B and S4G staff members introduced themselves and helped go over important details about Camp life. The respective Camps then separated for their own opening day festivities and the fun started! Counselors began arriving in late May to prepare our facilities for yet another amazing summer at Tripp Lake. A lot of effort has gone into the creation of a new Organic Garden, spearheaded by S4B staff member Blake Shafer in addition to the preparation of fields, courts and cabins. As a reward for the hard work of the Work Week contingent, the staff is rewarded by a sumptuous feast shipped all the way from Dreamland BBQ in Alabama – featuring Spare Ribs, Fried Okra, Sweet Potato Biscuits and Pecan Pie. This is a more recent tradition that has many staff members very excited for Thursday of Work Week. On the first day of Training Week, Sunday, June 16th, the staff gathered at the home of Mr. Ed, longtime Director of Camp Susquehannock, to celebrate his 91st birthday with singing, birthday cake and general merriment. In addition to the continuation of the work around campus, staff members participated in hands-on training sessions led by Senior Staff. 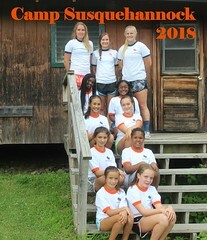 All aspects of Camp life are thoroughly discussed, including preparation for sports clinics, cabin duties, Overnight camp-out coordination, Waterfront policies and many, many more. The staffs of both Camps were able, however, to blow off some steam during a mini Orange and Blue Competition played throughout Training Week. Both staffs are a diverse mix of individual personalities and talents and we are all very excited for the arrival of campers on Sunday, June 23rd!